"To cash", the verbalization of the noun means "to convert to cash", as in the expression "to cash a cheque". 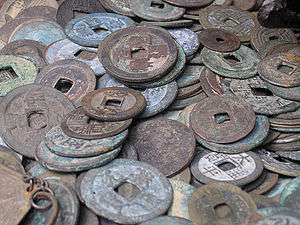 Traditional holed Chinese coinage is also known as Cash. In the early part of the 17th century, English East India Company coins were minted in England and shipped to the East. In England over time the word ‘Cash’ was adopted from Sanskrit कर्ष karsa, a weight of gold or silver but akin to Old Persian 𐎣𐎼𐏁 karsha, unit of weight (83.30 grams). East India Company coinage had both Urdu and English writing on it, to facilitate its use within trade. In 1671 the directors of The East India Company ordered a mint to be established at Bombay, known as Bombain. In 1677 this was sanctioned by the Crown, the coins, having received royal sanction, were struck as silver Rupees; the inscription runs "The Rupee of Bombaim", by authority of Charles II. At about this time coins were also being produced for The East India Company at the Madras mint. The currency at The Company’s Bombay and Bengal administrative regions was the Rupee. At Madras, however, the Company's accounts were reckoned in “pagodas”, “fractions”, “fanams”, “faluce” and “cash”. This system was maintained until 1818 when the rupee was adopted as the unit of currency for the Company's operations, the relation between the two systems being 1 pagoda = 3-91 rupees and 1 rupee = 12 fanams. Cashless society is the idea that in the future cash will be redundancy having been replaced by electronic means of transfer. In the UK it is now reported that 1 in 7 people no longer carries or use cash. ↑ Jean-Luc Dumont. "The Establishment of the Banking “Industry” – a 2500 Year Old Aryan ICH and Commercial Industry" | https://docs.google.com/document/d/1USeT6-9KtdA0zdQ73GGh-N_k9JYvUW7y-8zDnPdIhcM/edit?usp=sharing |. ACHF, 2016. ↑ "Federal Reserve Bank of Chicago, ''Debit Card and Cash Usage: A Cross-Country Analysis'', March 2007" (PDF). Retrieved 15 November 2013. ↑ Williams, John. "Cash Is Dead! Long Live Cash!". Federal Reserve Bank of San Francisco. ↑ "Banknote Statistics". Bank of England. ↑ "Banknotes and coins circulation". European Central Bank.